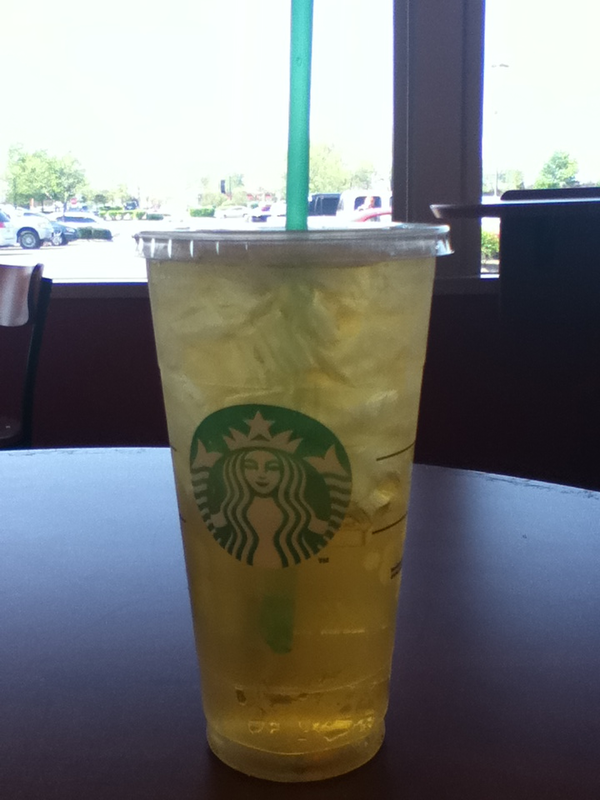 One of my favorite ways to soothe a sore, scratchy throat: Iced Green Tea from Starbucks. There are certain sore throats that call for a trip to the doctor. Strep throat, for example, requires antibiotics. Left untreated, a viral infection like strep throat can be very dangerous. If you suspect that this is the cause of your sore throat, make an appointment right away. My experience has been that most sore throats don’t require a trip to the doctor. A trip to the kitchen (or bathroom), followed by a trip to the couch is all that”s required! While I was growing up, my mother always reached for the canister of salt when I complained of a sore throat. The tradition has continued and it’s the first thing I reach for when one of my daughters says she has a sore throat. I won’t lie, when you first begin gargling with warm salt water, it won’t feel particularly wonderful – but as soon as you’re finished with your glass, something remarkable happens: Your sore throat feels much better. If you want to REALLY make your throat forget its worries, follow up the warm salt water with something very, very cold such as a Popsicle or sherbet. This is a particularly wonderful way to numb your throat if you’re trying to get to sleep. During cold and flu season, sinus drainage is a major reason for sore throats. Be certain you blow your nose frequently and sleep upon several pillows. These are measures that’ll lessen the drainage, and lessen the pain by the drain. Always drink a lot of liquids when you feel bad and get plenty of rest. Sort of hole up on the couch, watching reruns of The Golden Girls, Friends, I Love Lucy, Good Times, and Sanford and Son. Take it as an opportunity to treat your body to complete rest. Don’t fall for the premise of “fighting your way through it,” the proverbial “it” will catch up with you – and if you keep going to work, school, and social activities, you’ll only make everyone else around you sick. If that’s not enough to stop you in your tracks, maybe this will: If you spread sickness around, chances are you’ll end up getting sick all over again! When your immunity is down, you’re susceptible to a host of problems. If you thought gargling warm salt water sounded ridiculously gross, you’re going to love this next home remedy for sore throats: Drink cold pickle juice. I know, I know. Sounds horrible – and it’s not exactly a chocolate cookie – but for reasons I can’t explain, this seems to soothe many sore throats. Each sore throat is different, of course, but I’ve had pretty good luck with pickle juice. Simply pour out a little bit of the juice from your dill pickles into a glass. Then slowly drink the pickle juice, letting it rest on your throat before swallowing it. I did this approach just this morning, actually. It often causes you to cough up the phlegm that’s on your throat, irritating it. Needless to say, don’t overlook ibuprofen, Tylenol, throat drops, and throat sprays. Obviously, the trick is to ice it down and put out the burn. But trust me, if the icy treat comes AFTER gargling with warm salt water…. the effects will last longer. Take care of yourself and I hope you’re as good as new by this time tomorrow! bull. i just did gargle with salt water for 10 minutes… this stupid trick never works. and i never have step… so wtf. and seriously…. sugar only irritates your throat… you gotta be joking me, health 101? Tommy – I hope your health and your mood both improve soon, LOL. Some remedies work like charms for some people, yet do nothing for the next. These remedies work for plenty of people, or they wouldn’t have stood the test of time. Warm salt water and other remedies may or may not work for ALL sore throats – but, I do know that for the majority of my sore throats, they make me feel 99.9 percent better right away. Some people swear by drinking pickle juice for sore throats – but that just makes me kind of nauseous. I know lots of people who head to the fridge for it as soon as their throat feels scratchy. I’ve never heard of these home remedies for sore throat. To treat sore throat, I usually mix some warm water with a lemon juice and a tablespoon of honey and it works great. Cori, There’s something about the combination of lemon and honey that soothes a throat AND a cough. Recently I had a respiratory virus that had me barking like a seal until I turned to the lemon-honey combo. I finally got some much-needed sleep! I stopped reading when I read “If you make THEM sick, chances are the sickness will simply come right back around to you!” – Viruses don’t work that way. Once you’ve caught a cold, when it goes away your system is still full of antibodies and you cannot catch it again. Cute and well intentioned, but c’mon – that’s a pretty basic knowledge! I know your comment is well intended and I thank you for that. However, when one is sick (with, say, a cold) – their immune system is down… compromised, even. It’s much, much easier to get sicker at this point. Ever hear of a cold that “goes” into bronchitis or pneumonia? I’m not saying that someone who has a cold will go out and catch a cold. However, they are in a very vulnerable state and can catch something else. Common… and, yes… basic knowledge. However, what’s obvious to one person isn’t so obvious to the next. Information is published on the web for everyone – not just one. 1) Strep throat is a bacterial infection, not viral. Hence why antibiotics work. 2) For the commenters: A cold is a virus. You cannot fight a cold or the flu or any other virus with antibiotics. Also, point 1.
another thing… coughing undos all the saltwater help, so right now im being mopey…. i hate sicknesses that are just there! The part thats actually hurting is your immune system trying to kill the germs, you can’t actually feel the infection/virus hense the bigger the infection, the more it hurts. Strep IS a bacterial infection. That\’s why it requires antibiotics and why it works. You’ve contradicted yourself by saying “a viral infection like strep throat”. I found that dissolving an asprin or paracetamol in water and gargling with that, helps loads. Thanks for sharing the tip. I’ll have to file that away for cold season! Omg, thank you for these amazing tips. My mother always gave me a glass of water with salt , and it instantly help my throat feel soo much better. And thanks for the tip about the pickle juice, I tried it, and even though this sounds weird, it does help. I just had strep and tried multiple ways of getting rid of it, and pickle juice seemed to work for me!